Just a quick reminder that registrations are due tomorrow for the upcoming Singing Strings camp. Jen and Natalie will be at Park Royal United Church in the front lobby taking registrations between 4:30 – 5:30pm – please bring a copy of the registration form as well as your deposit. Those people who are not able to come to Park Royal church, you can either email us your form and arrange to get us the money, or pop the registration form and deposit in the mail to either Jen or Natalie. If you do plan on coming to Park Royal Church on July 20 (tomorrow), please bring any music that is sitting around and ready to be returned (ie. Seniors – Glorious Plumage, Serenade to an Island and Tchaikovsky’s Serenade for Strings) as Jen would like to sort through the music to close out the year. And if you are interested in coming to the Indian River’s August 26th concert (Djokic family & friends) – tickets are available to Singing Strings members and families for $10 each. Please let us know in advance if you are interested in coming as we need to get numbers to the concert organizers. Well, here it is the 15th of July already and we’re trying to get everyone organized to register for camp… I can’t recommend to you all enough to register for our camp, and come experience the beautiful new location we’re going to be using, let alone all the fun things we will do at camp! It’s tiring and crazy and fun and inspiring and I think we all play more in the 4 days of camp than we do the entire summer, which is great! This year I will be bringing my parents, which will be interesting for me; my father is a violinist and an avid composer, as well as being an amazing conductor and most importantly one of my musical muses of my life… and my mother was my grounding musical education person – she would yell note corrections from the kitchen was I was practicing piano and she was making supper – you see, my mom is a pianist, and was my very first music teacher before she decided that she didn’t think she could teach ‘scatterbrained’ me so she sent my sister and I off to another piano teacher. Which, in retrospect, I think was a good move. I remember having note accuracy competitions with my Dad (still do occasionally to this day) since we both have perfect pitch – I don’t know whether he let me win, but I do remember winning most of the time! Hope to try that with Lucas sometime too. And yes, Lucas will be coming to camp and hopefully my husband Bill too, with a few swimmers in tow. So, we’re all looking forward to the time at camp! Plus, being so close to Malpeque harbour, I can picture a few good lobster and seafood feeds for those of us who are seafood lovers! So register now – I know I’ll be there and hope to see you all there too! If you have any questions about anything, don’t hesitate to contact Jen Clement at jen@singingstrings.ca or Natalie Williams Calhoun at cellonatw@gmail.com and we will do our best to help! 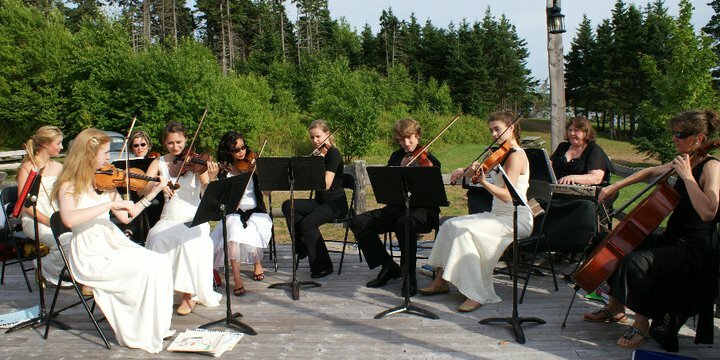 This is the new blog and website for the Singing Strings in Charlottetown, PE. We can use this site to post information about rehearsals, snack schedules, music to bring and practice, and about our upcoming camp! So check back often… We’ll try to keep it updated! We will be having a registration drop in from 4:30 – 5:30pm on Friday, July 20th at Park Royal Church (in the church lobby) if you would like to pay in person. Otherwise, you can return your form via mail to Jen or Natalie – contact us via email for our address details. Remember that we need your deposit and your form submitted by July 20th in order for you to reserve your spot at Camp! If we don’t get enough forms/deposits submitted we may not be able to hold a camp this year… so get your form in as soon as possible! Check out the menu links to the right to download our summer camp information – posted on Sunday, July 15. Please note that we need your deposit and registration form completed by July 20th – which is less than one week away! This year’s camp will be held at Camp Triumph – check out their information at www.camptriumph.ca for pictures of the beautiful site!